Maryland Shingle Roofing & Siding Contractors roof repair service. Trusted professional quality repairs at prices you can afford. Call today for a free estimate! A water stained ceiling may be one of the first indications the roof on your home may be leaking and in need of roof repair. It's important to quickly identify the cause of the leak and take corrective action to stop the water leaking into your home as soon as possible. Water leaks left unchecked can cause wood rot, mold and structural damage to your home if not corrected quickly. If you believe you have a roof leak you will want to have a professional licensed and insured roofer check for missing or loose shingles, damaged roofing and any objects that may have fallen on your home. This is where Maryland Shingle can help save you from costly damage associated with long term water leakage into your home. Professional roof repairs preformed right the first time can save you time and money. Our highly skilled licensed roofers can seal, repair and replace any worn out flashing or missing shingles quickly and effectively stopping additional water damage to your home. Roof repair costs can have a wide range on average from $250 to $1500 with many simple repairs being on the lower end from what we have experienced over the years. It's also important not to just do a temporary patch job and hope for the best. A high quality roof repair that addresses and corrects the root cause of any leak is essential to a lasting repair. High quality flashing and sealants can make the difference between a repair that lasts a few months or one that lasts for the long haul. Quality materials are very important but as you probably already know the person behind the tool is the real reason for a successful repair. At Maryland Shingle Roofing & Siding Contractors we have been diagnosing and repairing leaks for over 25 years. 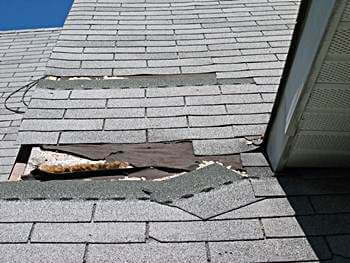 Over the years we have seen just about every kind of roof leak possible from plumbing vent pipe collars, missing shingles, blown off ridge vent, nail holes, dry rotted rubber boots, missing chimney flashings and just plain roof damage. We encourage you to browse through our free Leak Diagnosis pages for more information on causes of the many kinds of roof leaks and needed repairs. Maryland Shingle has the knowledge, experience and reputation to handle all your home repair needs. If your roof is leaking stay safely on the ground and call the highly skilled staff at Maryland Shingle today for a free no obligation estimate.